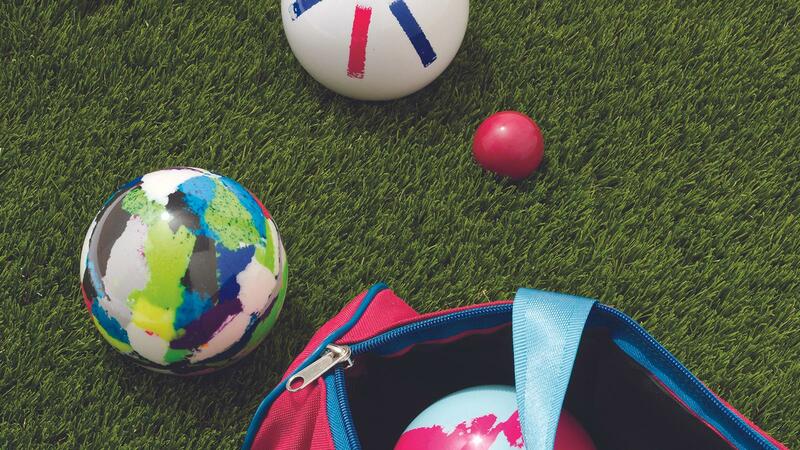 With respect to croquet fanciers, bocce is the real king of leisure lawn games. Simple to understand—participants bowl larger balls toward a smaller target ball to see who can get closest—it can be played on nearly any surface, from traditional crushed stone or grass to carpet and even asphalt. The only athletic requirement is the ability to roll a ball, thus precision and accuracy trump brute strength. Additionally, the leisurely pace of the game means you can keep an alcoholic drink on hand, as well as a lit cigar. Run-of-the-mill department-store sets break down fast, so we suggest sets from Italy's Super Martel, which retail from $200 to $275 and are available in a slew of snazzy color patterns (the pallino, sold separately, is $16 and the tote bag is $20). Martel balls are perfectly round, balanced and made of a high-grade, durable plastic. A tape measure or antenna is also useful to see which ball is indeed closer to the pallino. A coin toss determines which team gets the right to place the first pallino and roll the first ball, which is important as it sets the tone for the subsequent frame. Play then continues with the team farthest from the pallino rolling until they make a closer point. At the end of the frame, one point is awarded to a team for each of their balls that is closer to the pallino than the closest ball of the other team. Games typically go to 12 points. There are two types of rolls in bocce: pointers and shooters. A pointer is a deliberate roll intended to nestle as close to the pallino as possible to score a point, while a shooter is a high velocity attempt to knock the pointers away. Expert bocce players will often hurl a shooter through the air in a poetic arc via an underhand, palm-down style roll that imparts backspin so that the ball stops dead when it hits its target for a chance to steal an extra point. Once sufficient control is attained, tactics and strategy can become quite complex, and that's when the real fun (gambling, bragging rights and spirited disputes) begins.